What's It Like to Live in Bali? They say that the journey of a thousand miles begins with one step. 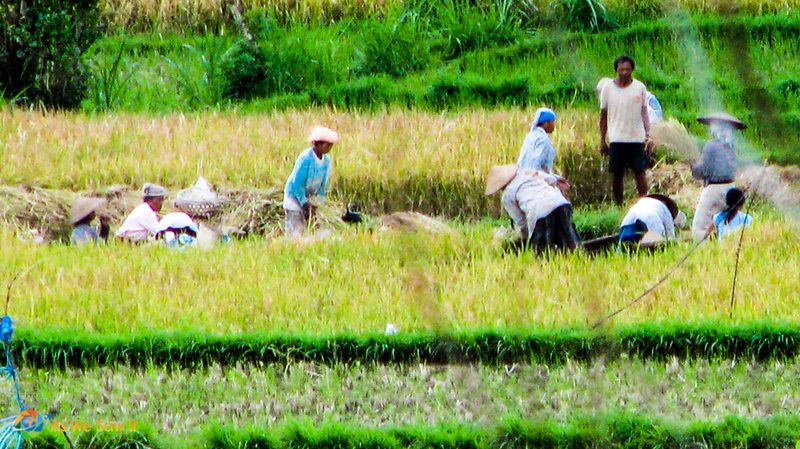 One of the first steps in our travel life occurred when we moved to Indonesia in 2010. It wasn't just the food or language. Everything was different in Bali and it all took some getting used to. As We Saw It began as a diary and photo album for our families and friends as we visited Dominica and then moved overseas the following year. Today I am bringing out the scrapbook. Take a look at my earliest journal entries as a first-time expat in Bali and see some of my first-time-in-Asia thoughts about living in another culture. I had a lot of things to learn about and a lot of attitudes to adjust. Literally sitting on the other side of the world from everything and everyone I have ever known, nothing seems the same at all. The tides seem to change more rapidly and the stars move faster. As my family and friends back home finish dinner, I'm thinking about breakfast. Cars drive on the left-hand side of the road. I flush by pulling the lever. The whirlpool goes in the opposite direction. The word for water is air. Most surprising, our hotel didn't ask to see our credit card until the end of our stay. Bali is so full of cultural differences, who knows what will happen next? If you dream of living on an exotic tropical island like Bali, one of the most important things you'll need to learn is that time is actually not all that important. We know it as island time in the Florida Keys and the Caribbean, but in Indonesia they use the term jam karet, rubber time. The next morning, I waited around our room for 3 hours before the hotel staff finally dropped by to take my laundry to the cleaner. And our two-hour drive from Kupang to Soe ended up as a full-day road trip. Yes, I know we are heading somewhere, but wait … I want some fruit. Attitude adjustment time. This whole easygoing attitude takes some serious getting used to. Obviously those who get frustrated by Indonesians' lack of concern for schedules will find life to be miserable. It's hard to adapt to their standard but there's little other choice, because they certainly won’t adapt to mine. Jam karet is probably a godsend for “type-A” Americans like me. Life back in America is rush, rush, rush. Do three things at once, none of them getting 100% attention or 100% effort. Here on the other side of the planet I still forget that there really isn’t anywhere I have to be or need to do right away. I need to keep reminding myself that nothing will fall apart if I don’t start shopping exactly when I had expected to. Sigh. I guess that is the beauty – and the challenge – of living in another culture. Perhaps there’s something to the zen concept of living in the moment. You know: Enjoy the ride. Didn't your mama ever tell you that it's rude to stare? Obviously, no mama in Indonesia. People seem to have nothing better to do than sit around and watch others. And I don't mean people watching, I mean out and out STARING. It's almost as if they are afraid to blink because they might miss something. I don't know, do they find foreigners especially fascinating, or do they do that to everybody? Maybe they know there's nothing better on television. It's either that, or I have lipstick on my teeth. Attitude adjustment time. I don't know how celebrities do it. It's hard to get used to being blatantly stared at. I'm not that interesting, people. Really. Getting personal can get uncomfortable. But not for them. Indonesians have a very different sense of personal space. Sometimes I wonder if they even know what the term “personal question” means. I don't mind the family questions too much but I really hate it when someone asks, “How much did you pay for that?” Inevitably they will meet your response with a wince and hissed intake of breath, implying that you naively paid far too much for the item in question and that they are far smarter and could have gotten a better deal. Attitude adjustment time. Nope, not gonna adjust my attitude on this one. I don't care where you are in the world, it is unkind to insinuate that someone has bad judgment. The next time somebody asks how much I paid, I have half a mind to respond, “seven hundred thousand dollars!” The problem is, I'm not sure that Indonesians would realize that I was being sarcastic. Have you ever had to adapt to another culture? Tell us about it in the comments. Wow, Linda! I had no idea you two had lived in Bali! How fabulous! While reading your article, I could not help but notice the similarities of the Bali people and the Ecuadorians. The questions they ask (and think nothing of asking them) are almost exactly the same ones the Ecuadorians will ask you. As you may remember, the words ‘planning’ and ‘logic’ are absolutely not in the vocabulary of the everyday Ecuadorian. Also, time is of no essence here, as well. Time means nothing. It is amazing, though, after 5 years, we have adapted very well, and we go nuts when we visit the states, even reverting to our type A personalities to survive. Living in another culture is an adventure within itself! Your Bali adventure sounds awesome! Thank you for sharing! It was, Judy, and so was our life in Ecuador. I had forgotten about the mañana mentality there. Maybe it’s something to do with the warmer climate?